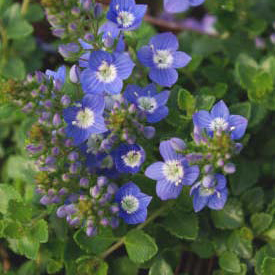 A tough drought-resistant evergreen groundcover, this forms a flat green mat studded with small bright blue flowers in late spring. Its dense habit makes this an ideal lawn substitute, tolerating occasional walking. Foliage turns bronzy in extreme heat and sun. Plants may be clipped or mowed after flowering to maintain a dense habit. Terrific when underplanted with spring-flowering bulbs. Turkish Veronica requires good drainage. Plants are easily increased by digging the clump and dividing into smaller pieces, in spring or early fall.